Five Canadian diplomats and members of their families who fell victim to mysterious health complaints while posted to Cuba are suing the Canadian government for $28 million in damages. The plaintiffs — 14 in total — accuse Ottawa of delaying their evacuation from Havana and their medical treatment. Radio-Canada spoke with some of the diplomats and their family members under condition of anonymity. "Throughout the crisis, Canada downplayed the seriousness of the situation, hoarded and concealed critical health and safety information, and gave false, misleading and incomplete information to diplomatic staff," says the statement of claim. The plaintiffs' names have been changed in this article to protect their privacy; they are still employed by Global Affairs Canada, although some are on leave and others are working part-time. Despite being back in Canada for over 18 months, they said they all still suffer from what they are calling "Havana Syndrome." Daniel, a career diplomat whose postings have sent him to some dangerous countries, said he, his wife and children were all diagnosed with brain damage in June 2017. "My wife, she isn't the same anymore. She has gaps in her memory, headaches, problems hearing. She picks up the telephone to make a call but forgets why, enters rooms without reason. She can't concentrate anymore," he told Radio-Canada's AzebWolde-Giorghis. Catherine, a young mother and diplomat taking part in the lawsuit, said she suffers from migraines and excessive fatigue. She said she is also very sensitive to light and needs to wear sunglasses in her own home. Her colleague Manon, who also has a family, said she has concussion symptoms without ever having suffered head trauma. All of these employees said their symptoms emerged in the spring of 2017. They said that it wasn't until the summer of that year, when Daniel was evacuated to Miami with his family, that they realized they were all suffering from the same set of symptoms. They weren't the only ones; their colleagues in the American embassy were also suffering from the same symptoms at the time. But the U.S. withdrew most of its non-essential diplomatic staff in September 2017, and Canada did not. The statement of claim says Canada waited until April 2018 to evacuate the families of its diplomats in Havana, and gave staff there the option — in April and again in November 2018 — of returning home. 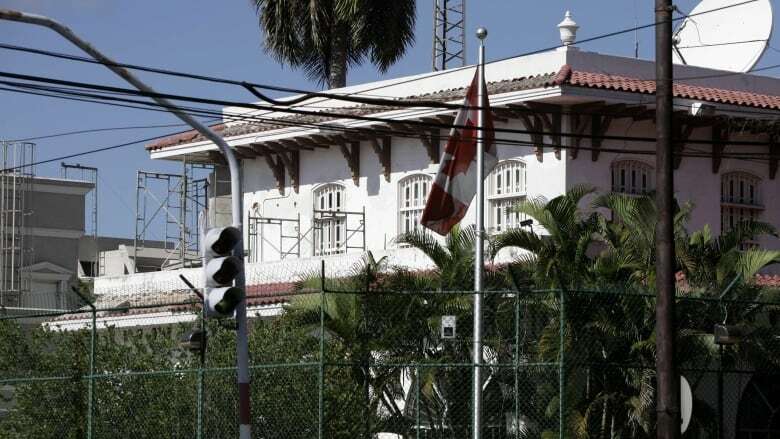 In January 2019, Canada announced it would be removing up to half of the staff at the Havana embassy after another Canadian diplomat there fell mysteriously ill. The diplomats who spoke to Radio-Canada said they don't understand the reasons behind the delay and accuse the federal government of having kept them in the dark. "Why didn't we have access to the specialized care we needed? This wasn't by chance. It was the result of their decisions," said Manon. "Who will give us this time back?" Catherine said she doesn't understand why the government continued to send families with young children to Havana up to April 2018, despite the red flags that had been raised. Foreign Affairs Minister Chrystia Freeland told reporters today she has met with some of the diplomats and their families, adding she would not comment on the lawsuit. "I'm really concerned about them and they have Canada's utmost sympathy and support. They were in Cuba representing us, and representing our country, and their health and safety absolutely needs to be a priority," she said. "When the U.S. was withdrawing its diplomats, Canada knew there was a problem and we didn't pull our people out," said the plaintiffs' lawyer, John Phillips. "What we're looking to be compensated for, is the long term damage that's been done, to the diplomats and their families. It's brain injuries and it's long term." The cause of the diplomats' symptoms — and the matter of whether it was the result of a targeted attack on the embassy — both remain a mystery. Neither Canada nor the U.S. has suggested a cause, although initial speculation centred on the possibility of some kind of sonic attack. Cuba has denied any involvement. The affected diplomats are being monitored by the University of Ottawa's Brain and Mind Research Institute and the Brain Repair Centre at Dalhousie University in Nova Scotia.